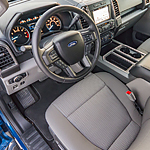 If you are a driver who enjoys off-road trails, then you might want to take a close look at the new Ford F-150. This full-size pickup was built from the ground up with durability and safety in mind. The 2018 F-150 is going to get you to your destination no matter what the roads are like. In addition to having a high-strength steel frame, the new F-150 also boasts a military-grade aluminum body. When it comes time to hit the trails, you can quickly change into four-wheel drive with the electronic shift-on-the-fly (ESOF) system. Once the 4WD mode has been engaged, you are going to benefit from the Hill Descent Control system, off-road tuned shock absorbers, and electronic-locking rear differential. From running errands around Matteson to off-road adventures, this truck was built to tackle any job. Call Sutton Ford Lincoln today to schedule a test drive for the 2018 Ford F-150.